Derick Whitson is an artist currently living and working in NYC. 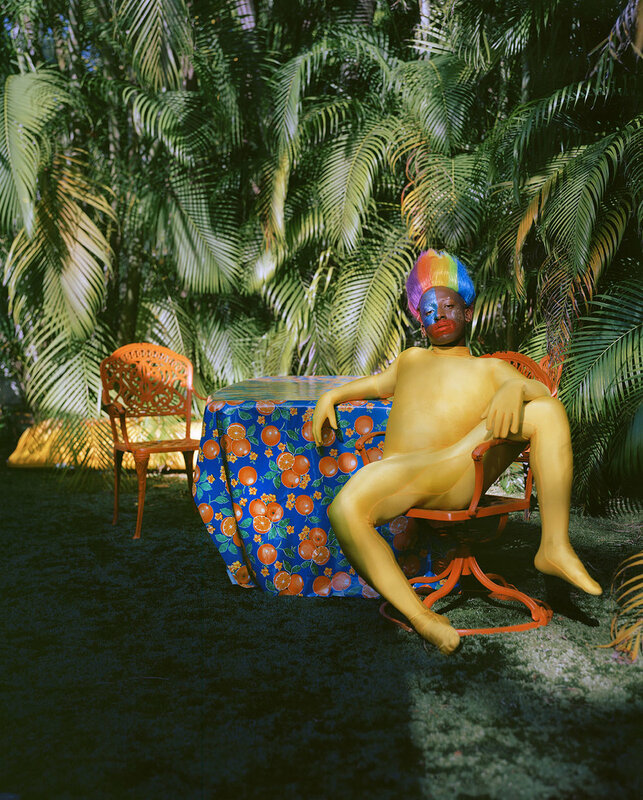 Working primarily in photography and video, Whitson explores the history and relationships of clowning, drag queens and black/white face to explore the social constructs of race, gender, and sexuality. Whitson has attended artist residencies at AICAD New York Studio Residency program, NY, Mass MoCA, Massachusetts, The Fountainhead, Miami, FL, and The Galveston Artist Residency. 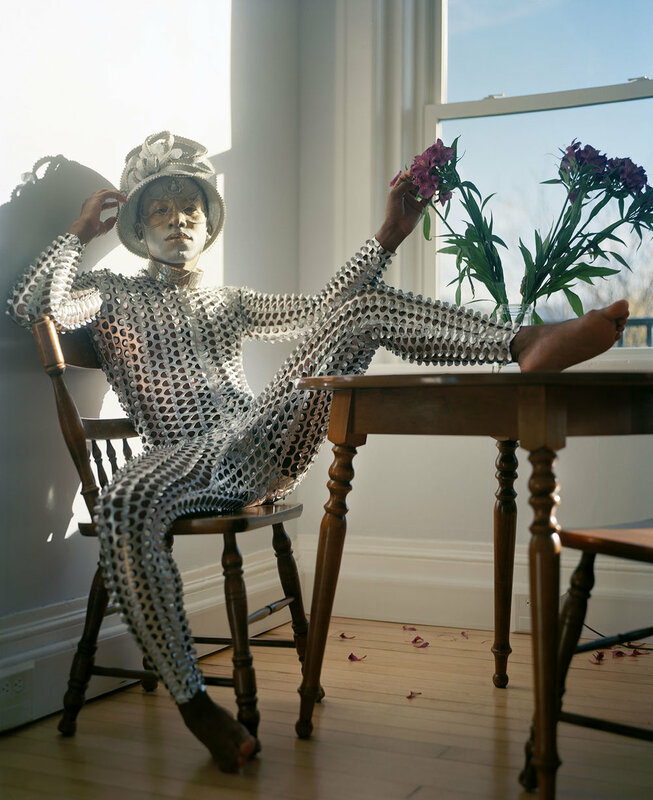 Recently his work has been exhibited at Art Basel, Miami FL, The Studio Museum in Harlem, and The Center for Fine Art Photography in Fort Collins, CO. Located in Holy Trinity Church lyes a rendering of Joseph Grimaldi; Joseph Grimaldi, considered to pioneer circus clowning in London, England. In the 18th Century Joseph Grimaldi performed in black face and white face. Black face subsided while white face remains as the main representation of clowning. Between 1830’s-1910 across the US were performances of minstrel showings, these shows became mainstream in 1848. The minstrel shows lampooned black individuals with modern stereotypes. Othello, originated in London, by Shakespeare, is known as the most famous performance of white males performing both gendered roles and in blackface. Shakespeare also employed jesters & clowns, the first play was Lord Chamberlain’s Men. 1980’s and early 90’s we have a resurgence of the Club Kid Culture scene, that was comprised of wealthy white individuals, that then leads us to contemporary platforms like Rupaul’s Drag Race. 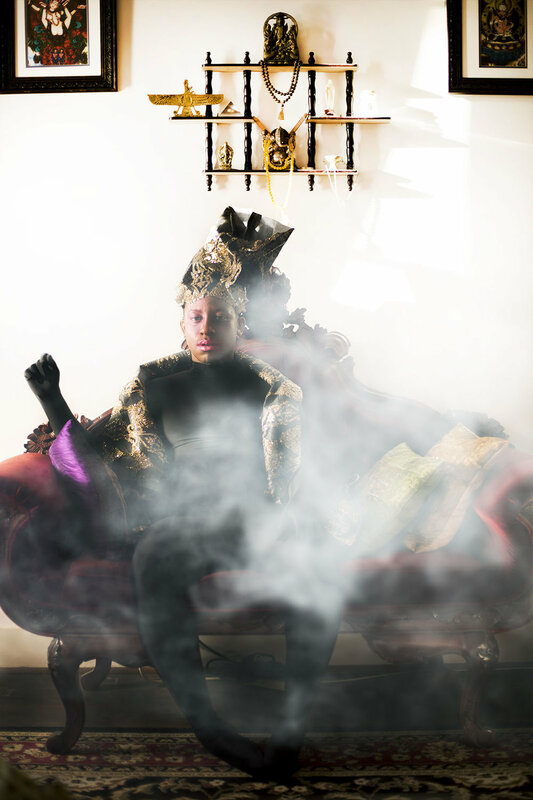 As a spectator of such platforms and histories, levels of performance and masking are metaphoric representations of the repression of race and gender. The white clown face is blackface in disguise. Blackface which originated through clowning, created new stereotypes and perpetuated mistreatment and racist behaviors years to come. There are pioneers, sub cultures, and individuals that are transforming, and questioning the roles of identity through race in makeup, gender through costuming, and humor/entertainment through pain. The different levels of engagement and influence hold a large amount of information in standards of beauty traced from all over the world. I use photography to create a new form of identification through methods of masking. This is a form of representation, as an explorative generation of power through image making. This would be a start to a larger extended project. This photographic amalgamation is political, subversive, and affirmative imagery that forms a racial & gender non conforming empathetic utopia. When and where did Sugar (Chapter II) project begin? Sugar (Chapter II) started after completing the first chapter titled "Sissy Guys Only", Sissy Guys Only is in response to queer spaces. I created staged photographs that were recreations of places I visited all over the US. Sugar (Chapter II) is in response to Sissy Guys Only. I've been performing in front of the camera for most of the images in Sugar, creating new characters that are seen outside of myself in response to the history of clowning, and ways of representation through performance culture. The work has moved beyond just taking the photo. The work has become about all aspects of making an "image", playing the role of the model, the directer, the set designer, the costume designer, and the creative directer to make the image. Sugar (Chapter II) is currently in progress. I am attending the Galveston Artist Residency located in Galveston, Texas, where I have access to 11 months of uninterrupted working time to produce the work and show the work in an exhibition in June. While here in Galveston I have been working closely with the historical foundation, photographing inside the homes pre 1900's flood. The work will be displayed in a fully realized installation, showcasing the images and a set for them to live inside. What's currently helping me sustain my creative practice are the opportunities through the artist residencies I've been participating in. I'm allowed time & space. The images produced are highly influenced by living in new cities, I create images based on the most recent experiences. My non-art related hobbies that help me stimulate my creativity is swimming. I've been swimming since the age of 3, and did competitive swimming in high school. The ritualistic routines of moving in the water helps my mind and body connect to serve how I use my body in front of the camera. Dance has also become a large part of my practice, I utilize movement within the videos I produce. I was recently featured in an edition of En Foco's, Nueva Luz, Queer Issue.